Gurcharan Singh Dhindsa remembers an intense toothache. He felt unsteady as he walked down the stairs at his local Gurdwara. The 81-year old Abbotsford man somehow drove home and lay down on his bed. When his wife and granddaughter checked on him, he could no longer speak. He fell over when they tried to get him up. Unbeknownst to the family, a large clot had blocked one of the major arteries providing blood flow to the brain, triggering a potentially devastating and deadly stroke. Time is critical during a stroke, as brain cells that are deprived of oxygen begin to die within minutes. As a result, patients should go to hospital right away. Mr. Dhindsa was rushed by ambulance to Abbotsford Regional Hospital, the nearest of Fraser Health’s designated stroke centres with an ability to administer the clot-busting drug tPA (tissue plasminogen activator) intravenously. But the clot was so large, his only option was to have it physically removed (thrombectomy). In British Columbia, there are two hospitals with the proper skillset and facilities to attempt this. One of them is Royal Columbian Hospital. 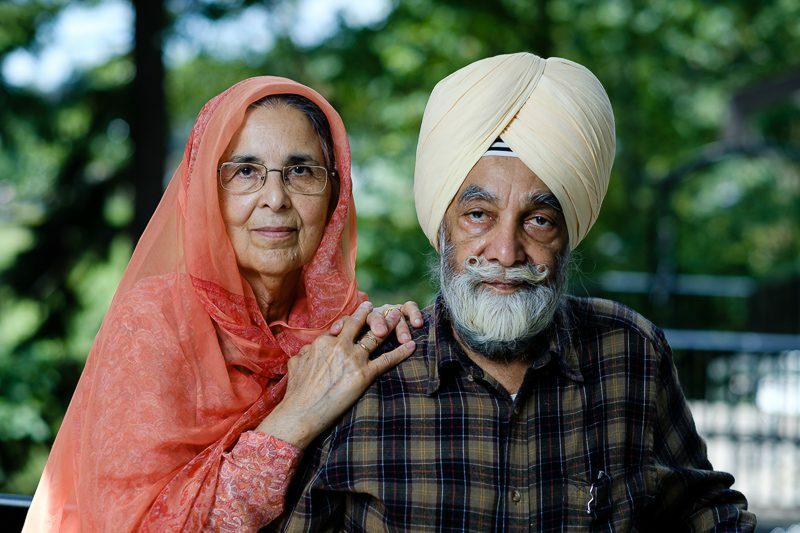 “I could see just a bit, and I couldn’t speak properly,” remembers Mr. Dhindsa about his symptoms as he was transferred from Abbotsford to Royal Columbian for an emergency thrombectomy. Essentially, the medical team at Royal Columbian would slide a thin catheter from the patient’s leg artery right up into the head to grab or suction the clot out. It’s a procedure that is increasingly gaining prominence as a life-saving option for some of the most severe strokes. A series of studies released in 2015 have shown that endovascular treatment, offered at specialized centres like Royal Columbian Hospital, can save some stroke patients from severe disability or death. Left: Dr. William Siu examines an image of the blood vessels of the brain in the Multipurpose Interventional Suite. Right: Royal Columbian Hospital’s Multipurpose Interventional Suite opened with the help of donors to Royal Columbian Hospital Foundation. Royal Columbian Hospital has a team of neuro-interventionalists as well as specially-trained nurses and technologists. They rely on CT scan technology to locate the clot and then utilize advanced imaging equipment and tools to restore blood flow to the brain. The most impressive imaging equipment for this work at Royal Columbian is situated in the Multipurpose Interventional Suite (MPIS), a uniquely high-tech space that opened in 2012 with help from Royal Columbian Hospital Foundation donors who contributed close to $3 million towards the project. Despite the highly-skilled team and the incredible technology at their disposal, there are two other factors that can affect a patient’s outcome – time and luck. The sooner a patient can receive care, the better. And the way blood flows to the brain offers some people, like Mr. Dhindsa, a greater chance. Mr. Dhindsa spent less than two weeks in hospital before returning home. Two months after his stroke, he describes himself as feeling okay. He has some weakness in his legs and his eyesight is sometimes impaired. But his family is grateful he remains mobile and can still speak.